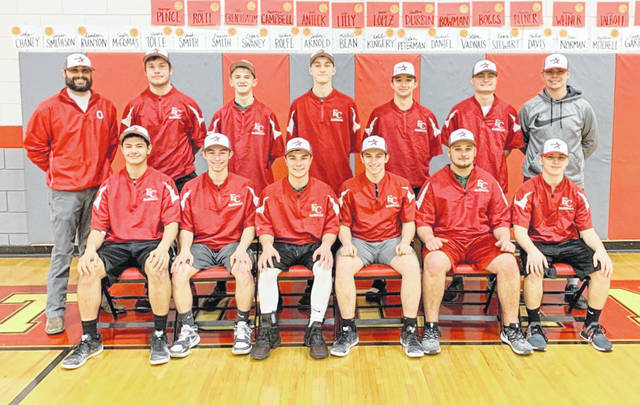 The East Clinton High School baseball team, from left to right, front row, Austin Arellano, Zachary Mitchell, Austin Rolfe, Matthew Mitchell, Robert Norman, Tristen Burkitt; back row, head coach Brian Carey, Colton Vadnais, Quinten Tolle, Matthew Hall, Isaiah Curtis, Caden Stewart, coach Cameron Conner. Team members Cameron Vadnais, Matthew Horn, Wyatt Riddle were not present for the photo. Now in his third year as East Clinton varsity baseball coach, Brian Carey doesn’t want a repeat of 2018. He hopes the juniors and seniors on the EC squad feel the same way. “I have had these seniors and juniors now for three years,” said Carey. “It is now time for them to step up and lead this team to a league title. When we watched Blanchester seal the SBAAC championship against us last year, it hurt. Carey will have Cam Conner and DJ Henry coaching at the high school level with Don Morrow, Daniel Day, Jeff Walker, Eric Slagle, Tom Bieting and Bobbie Pierson coaching at the junior high level. East Clinton was 9-9 last season and lost three players, including first team All-SBAAC pitcher Brandon Norris. The Astros have returning Zach Mitchell (first team All-SBAAC), Austin Arellano (first team All-SBAAC) and Matt Mitchell (second team All-SBAAC). Newcomers include Quinton Tolle and Isaiah Curtis. Carey said the main concern currently is a lack of depth in the pitching department. East Clinton lost its top two hurlers from a year ago. The coach likes the infield play as well as the offense, both “should continue to be consistent,” he said. Carey said Blanchester and Clermont Northeastern should be the National Division favorites in 2019.
https://www.wnewsj.com/wp-content/uploads/sites/22/2019/03/web1_BAS_ecteam.jpgThe East Clinton High School baseball team, from left to right, front row, Austin Arellano, Zachary Mitchell, Austin Rolfe, Matthew Mitchell, Robert Norman, Tristen Burkitt; back row, head coach Brian Carey, Colton Vadnais, Quinten Tolle, Matthew Hall, Isaiah Curtis, Caden Stewart, coach Cameron Conner. Team members Cameron Vadnais, Matthew Horn, Wyatt Riddle were not present for the photo.